Hockey fans around the world are pulling their favorite team's jerseys out of their closets, restocking the fridge in their team memorabilia filled man caves, and gearing up for the 95th NHL season, which is set to get under way in just a few hours. At the start of every season there are favorites to win the Cup and various individual awards, teams that seem destined to fail, and players that are certain to leave their mark in the record books. Before players, once again lace up their skates in order to try and get a chance to lift hockey's holy grail, here is 11 predictions about the 2011 season. 1. The NHL will lose three of it's greats. Nicklas Lidstrom, Teemu Selanne, and Martin Brodeur will retire at the completion of the 2011-2012 season. Between the three players, eight Stanley Cups, seven Norris Trophies, one Calder Memorial Trohpy, and four Vezinas have been won. Martin Bordeur is entering the final year of his contract and has recently been plagued with injuries, the conclusion of this season may be the most oppurtune time for him to gracefully bow and retire the best goalie the sport has seen. Lidstrom has considered retirment the last few seasons but continues to make heroic returns to the Red Wings. Eventually his time will run out and that may be this season. While those two remain unsure about whether or not they will infact retire, Selanne has mentioned that this season will be the last of his career and retire at the conclusion of the season. 2. The Nashville Predators will win the Central Divison. The Predators always seem to find themselves behind the large shadow cast by the Red Wings and Blackhawks, but this year will be the year Pekka Rinne and Shea Weber backstop the Preds and bring a division title to "Smashville". If the Preds are crowned the best of the Central Division watch for Barry Trotz to be a front runner in the Jack Adams race. 3. The Winnipeg Jets will make the playoffs. The late Atlanta Thrashers made the playoffs once in their existence, in '06-'07 when they won the Southeast Division. However, that was the franchise's only breathe of fresh air. Now based in Winnipeg and called the Jets, a team with stars like Dustin Byfuglien, Evander Kane, and Eric Fehr, should thrive in front of the first real fans the team has had in quite some time a make that leap into the postseason. 4. Suspensions will be dished out quite frequently. At the conclusion of the preseason a total of nine players will miss 31 total games due to suspensions, primarily for head shots. Since new dean of the NHL, Brendan Shanahan, has taken over control of the league one thing has been clear, head shots will not be tolerated. That being said watch for the suspension to be given often, at least for the early stages of the season before players learn what is acceptble and what is not. 5. Alex Ovechkin will win the Hart Trophy. There is a tremendous amount of pressure on the shoulders of the Washington Capitals. They have probably the best team on paper but continue to fail to get over that playoff hump and in to the Stanley Cup Finals. Watch for Ovechkin to respond from last season where he scored a career low in points and return to his 100+ point form carrying his team to the finals. 6. The San Jose Sharks will fall short once again. Over the past two seasons the Sharks have made it to the Western Conference Finals and came up short in both contests. Sure the Sharks added some grit and size with additions like Brent Burns and Michal Handzus, along with a little bit of scoring with Martin Havlat, but it is just hard to picture the Sharks succeeding because of their past struggels. Anyways another Pacific Division team is set to sneak up and steal the Western Conference title. 7. Ryan Miller will win another Vezina. Last season, Miller looked human in some instances, and was relied upon quite frequently to win games for the Buffalo Sabres. However, over the summer Terry Pegula openned his wallet and brought in some key pieces like, Christian Ehrhoff, that will help out Miller and growing star, Tyler Myers. Miller should have a lighter work load this season and should return to Vezina form. 8. The Columbus Blue Jackets will miss the playoffs, again. Sure, the Blue Jackets probably have the best roster they have had since the team came into the league back in 2000. Rick Nash will finally have a center to play with, with Jeff Carter coming in from Philly, and they picked up a talented James Wisniewski on the back end but the Blue Jackets will fall short in net and depth causing their playoff drought to stretch through another season. 9. The Phoenix Coyotes will fail to make the playoffs. It is hard to see the Coyotes making it out if the regular season and into the playoffs with Mike Smith in net. The team is going to have a tough time winning games consistanly in the super competitive, Pacific Division, with out a goalie like Ilya Bryzgalov between the pipes. This season might be the season that head coach, Dave Tippet, is unable to make a lot out of the little that he has. 10. Gabriel Landeskog will win rookie of the year. Coming out of the draft many saw Landeskog as the most NHL ready pick. Although he only picked up one point in his four preseason games, the 6' 1" defenseman, will get tons of ice time for the Colorado Avalanche and possibly develop into a Tyler Myers like tower on the blueline for the Aves. Sorry Brayden Schenn. 11. The Los Angeles Kings will win the Stanley Cup. 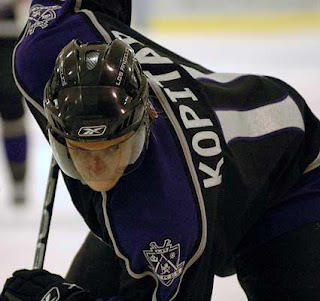 After losing in the first round of the playoffs the last two seasons many beleive this is the year the Kings will make a deep run at the Cup. On the contrary, this is the year the Kings WILL win the Cup. It just feels as if everything came together for the Kings over the offseason, they added depth down the middle with Mike Richards, gained experience and character with Ehtan Moreau and Trent Hunter, and gained a possible 30 goal scorer with Simon Gagne. Add all that to a core that boasts, Anze Kopitar, Dustin Brown, Justin Williams, and Jonathan Quick, and it seems like this might be the year the Stanley Cup makes its Hollywood debut.